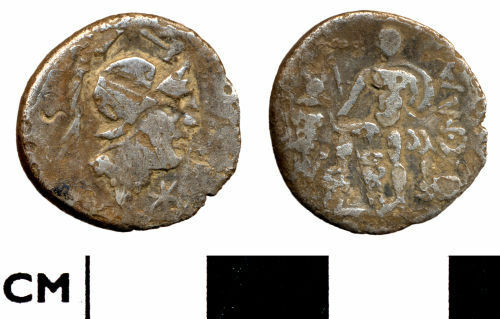 Republican denarius. Issued by C Publicius Malleolus. The head of Mars on the obverse and a hero figure with trophy and prow on the reverse. Obverse description: Helmeted head of Mars facing right. Hammer above and * below. Republican moneyer: Publicius Malleolus, C.
A silver Roman Republican denarius of L. Caecilius Metellus and C. Publicius Malleolus (99 - 96 BC), mint of Rome, RRC 335/9. A silver Roman Republican denarius of L. Caecilius Metellus and C. Publicius Malleolus (96 BC), mint of Rome, RRC 335/10a.